I qualified from Glasgow Veterinary School in July 1984. After carrying out two months of locum work around the country, I carried out a year as Resident for Large Animal Medicine at Glasgow Vet School, before joining a mixed practice in Chorley, Lancashire for two years. 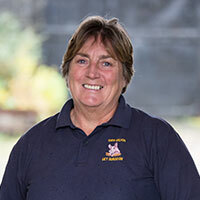 In May 1987, I started up Kilbarchan Vets along the road at 19 Steeple Street before moving and upgrading to our current premises in May 1991, and the rest is history! I used to do Point-to-Point, until my children came along in 1999 and 2002. We are all now very keen polo players. I have a small farm with a herd of pedigree Aberdeen Angus and all our polo ponies.